Did you ever find something, and not even realize until that moment that your life had been missing that exact thing? That your life had a hole which was now perfectly filled? I had that experience tonight, watching Lucio Fulci's Zombie when, about halfway into the movie, I watched a zombie fight with a shark. No - it's not enough for me to tell you. You really have to see for yourself. Although I'd never seen this movie before, it's been on my radar for a while. At the video store my family used to go to when I was a kid, there was a VHS copy of this in one corner of the store with the same cover as in the picture above. I was terrified even to walk past it. 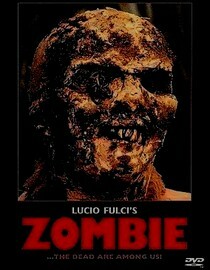 It wasn't as frightening as I used to fear, but it was a great movie to end my block of zombie flicks on. Now that I've seen two of Fulci's films, the thing I notice is that he's not necessarily gorier than other directors, but he's very inventive with the gore he does use. There's a scene where multiple zombies are resurrecting out of a graveyard, and it's just fantastically done. Also, the final shot of the movie is one of the most well-known in zombie movies, with a horde of them shuffling across the Brooklyn Bridge into Manhattan. My favorite thing, though, was that this movie really played up the voodoo angle as a part of the zombie plague, complete with pounding jungle drums. I give this one four sharks out of five. Have you ever seen Weekend at Bernie's II? Undoubtedly the weirdest zombie pic ever. He's basically a zombie -- whenever he wears headphones or hears music, he starts this freaky dancing. The end has him walking along the bottom of the ocean past a tourist submarine. It's utterly amazing. I'm serious. maybe i wasn't watching closely. but, i don't think that shark had teeth. how can i believe this zombie fighting a shark scene if they're not even going to make it realistic? They had to work within budget constraints, I'm sure. In the big budget Hollywood remake, Sean Penn is slated to play the part of the shark, and that dude is METHOD, so he'll make you believe it.